So, what do you do with used motor oil and filters? Recycle them! Every year approximately 13 million gallons of motor oil that has been sold to the public is unaccounted for. California has no record of that motor oil being recycled. What happens to it? Maybe it is disposed of improperly…thrown down the storm drain, poured down the drain, poured on to a patch in the back yard, or thrown into the garbage. Each of these methods of disposal is not only illegal, it is toxic to our environment! Used motor oil contains such contaminants as lead, magnesium, copper, zinc, and arsenic! If these contaminants reach the ground, they can seep into our water supply and cause serious pollution. If they are released into our storm drain system they get washed away with the next rains directly into the ocean! Used motor oil and filters are very recyclable. Oil only gets dirty, not worn down. It can be cleaned and used over and over again. Used oil can be re-refined into new engine oil, or processed into fuel for heating. Not only does recycling oil help stop pollution, but it also conserves resources and decreases the demand for new crude oil. The steel components in oil filters are highly recyclable, too! Recycling used motor oil and filters is easy! There are dozens of local businesses which will accept your used motor oil and filters FREE of charge. And you are eligible for a $.40 per gallon rebate. Don’t Dump Used Motor Oil and Filters! Every gallon of used motor oil that is improperly disposed of by throwing it into the trash, pouring it down a storm drain, or out on the ground pollutes our environment. If one gallon of motor oil enters our coastal ocean waters it can create an oil slick larger than one acre. That same gallon of used motor oil can make 1,000,000 gallons of fresh water undrinkable. Oil dumped on the ground reduces soil productivity. In the U.S., less than 60 percent of used oil is recycled. Do Recycle Your Used Motor Oil and Filters! 1 in 5 households have a do-it-yourself (DIY) oil changer. As of July 2004, there are more than 2,600 State-certified collection centers and 70 curbside collection programs in California, which accept used oil for free. 2.5 quarts of re-refined lubricating oil can be produced from one gallon of used oil. Click here to find your nearest Used Oil and Filter recycling locations. Used motor oil and oil filters are considered hazardous waste in California. Never dispose of used motor oil by pouring it out on the ground, down a storm drain or by disposing of it in the trash! Never dispose of used oil filters in the trash. Encourage your friends and neighbors to recycle their used motor oil and filters too! Remember, pollution caused by used oil and filters affects us all. Helps prevent storm water pollution. Saves natural resources–used motor oil never wears out, it just get dirty, and can be cleaned and reused over and over again. The steel from used oil filters can be easily recycled into many new products. Used motor oil and oil filters can easily be recycled! There are more than 2,600 State-certified collection centers and 70 curbside collection programs in California, which accept used oil for free. 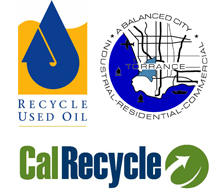 Call 800-CLEANUP or visit “Where to Recycle” to find the used oil recycling site nearest you.